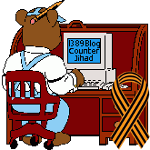 2007 November — 1389 Blog - Counterjihad! Ditch those Citigroup credit cards! You’re a Mean One…Mr. Grinch! Uh oh! This is a LOT of explosives! CAIR boycotts us – we boycott them!